Badger died yesterday. She had not been well for weeks and we were dreading the visit to the vet. So was she, and every time the door to the waiting room opened she made a half-hearted attempt to leave. The options held out little hope for our friend and with tears we asked for the vet to come home later; for her final moments to be in a place she hated and feared was not conceivable. As we busied ourselves preparing a party to welcome another friend into the world she lay behind a chair panting, occasionally shifting herself to the open door where she lay as she always did surveying her kingdom and subjects with a gimlet eye. Standards had to be maintained. In the late summer rain I set out to dig her grave alongside her minions and predecessors. Tears and rain soaked my shirt in equal measure as I toiled and sweated through baked hard clay and roots contemplating the forthcoming betrayal that, paradoxically, would be the last act of friendship. She was lying on the sofa with Louis stroking her. We lay her across the three of us and she allowed us to run our fingers through her mink-soft coat and massage her pointed muzzle. She started as the vet shaved a small patch on her leg but relaxed as we spoke to her, not seeming to notice the needle or the final plunge of the driver. The life drained out of her in an instant. Her beautiful fur was the same but her characteristic twitching alertness had departed. Badger was gone. She had come to us in tears. We had two terriers, mother and son whose hunting instinct trumped their domestic. In an act of calculated brutality a neighbouring farmer had collared them in the act of chasing his cat and shot them both in cold blood. He had neither the decency or the courage to tell us himself and the police broke the news to us and our still very young boys. 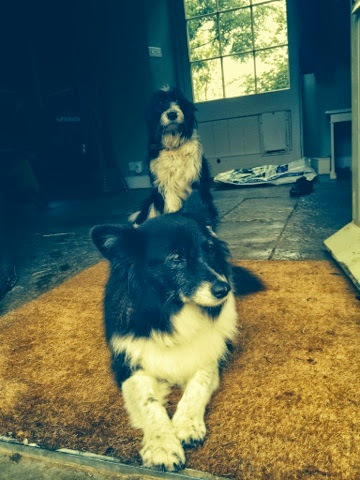 A gamekeeper friend, outraged and concerned, offered us his son's collie as a replacement (she was not up to the mark as a working dog) and it was Badger who sprang out of the back of his Landrover to claim her kingdom - and rule it firmly and verbally for twelve years. She was primarily a Sheltie collie with the characteristic pointed face and luxuriant ruff of black and white fur that was always immaculate and only faintly smelling of dog. Joe would walk around with her slung over his shoulders as living stole and we always joked, semi-seriously, about having her stuffed like the hound in De Lampadusa's The Prince. To say that she was top dog would not do justice to her imperial status. Though considerably smaller than most of her canine subjects and visiting dogs, she ruled them all with a rod of iron; any that stepped out of line instantly knew the error of their ways. She deferred to her humans - but only a secundus-inter-pares - and often despaired of their chronic slackness in matters of security as she patrolled the bounds or lay on the doorstep,with nose and ears twitching, listening out for the rumble of a car crossing the cattle grid or any other border incursions. With other dogs as subjects, she courted the company of humans with either a muzzle nuzzled into the crotch or an insistent paw laid on the lap. She was promiscuous with her affections and around the world are scattered her fan club who all think that they had a unique relationship with her. She even received fan mail with one French friend of Luke's signing off a love letter to her with words 'Badger, mon amour, your eyes are like Lucifer but your heart is pure'. She was the daemon of our home, its spirit and its guardian; our friend, companion and comforter. There will never be a dog like her.